On Monday night, 90210 was down by nearly 18% in the 18-34 female demographic, to a 1.4 rating. 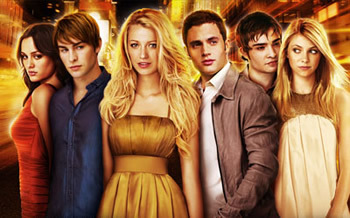 Gossip Girl was also down, by 11% in the young female demo, to a 1.7 rating. This was enough to lower the show’s season average. Tuesday, One Tree Hill was up by a whopping 26% in the young female demo to a 2.4 rating. Hellcats was down by 7% to a 1.4 rating. On Thursday, Vampire Diaries was up by 4% in the demo but Nikita lost 23%, hitting a 1.0 rating with females 18-34. Below is a list of the regular CW TV shows and their 2010-11 season average ratings to date. It only incorporates the ratings for original episodes that have aired this season (no repeats). The data is sorted by the 18-34 female demographic averages, the group that the CW focuses on attracting and selling to advertisers. The “compared to” column reflects whether the demo average has gone up, down, or stayed the same. The closer a show is to the bottom of the list, the closer it is to being cancelled (if it hasn’t been cancelled already like Life Unexpected). If it’s closer to the top of the list, it’s more likely to be renewed. Shows that are in the middle (“on the bubble”) can be a little tougher to call. Their future typically comes down to other factors like overall costs, contracts, who produces the show, and what new shows are on the horizon. It should be noted that Friday nights are one of the least watched evenings of television so ratings for shows on that night are lower. The network understands this and takes it into account. However, regardless of when a show is aired, its production costs remain the same. Ultimately, it must still be profitable enough for the network to keep ordering more episodes. What do you think? Any surprises? Which shows do you think won’t survive to see a new season? hey plz help out !! y itz showing “Sorry, this content is not available in your location”..??? I heard Blair from GG wants to leave the show after season 5 and Chuck doesn’t want to do the show anymore. How many episodes do the 90210 writers need to find out their recent rating success is due to the Teddy/Ian story line, as it attracted a demographic that largely ignored the show. The recent two episodes have either excluded or minimal content to that particular plot, hence significant ratings drop. According to perezhilton.com, this plot should be revived soon. However, if they don’t carry that momentum well, the show will likely be axed before May. And i really hope Supernatural is coming back. With outthat show on there I would quit watching this network. Why doesn’t this site show the male viewers for this channel ?. I mean there demo is aimed at women..but I bet if you figured the male demo out for Supernatural , the rating would be higher and the demo would be higher too. Im a big fan of Supernatural and im not female. There stories are awesome. I mean the dragon episode was a bit off. I think they should of had this season for season 5 and ended the series with the Heaven /Hell, Lucifer thing. @Kevin: Because the network markets towards young females. This index is based on W18-34. I guarentee you that NIKITA and SUPERNATURAL will both be back!!!!!!!! I love Supernatural and I am hoping that the show will be renewed. I hate waiting and waiting to know.